Atherosclerosis is increasingly recognised as an inflammatory disease. The inflammatory process begins with the oxidation of low-density lipoprotein (LDL) in the artery wall. 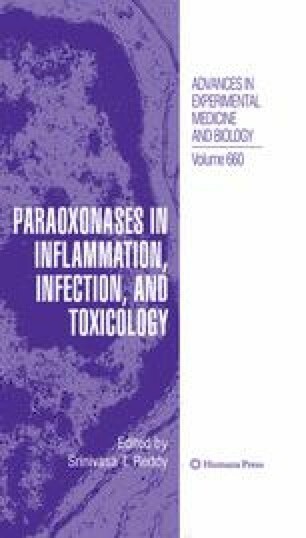 The ability of high-density lipoprotein (HDL) to inhibit the oxidation of LDL (and cell membranes) and promote macrophage cholesterol efflux through the action of several of its associated proteins, particularly paraoxonase-1 (PON1), reduces the inflammation associated with atherosclerosis. In vivo, in animal models, ablation of the PON1 gene is pro-inflammatory and pro-atherogenic, while overexpression of human PON1 is anti-inflammatory and anti-atherogenic. In subjects with diabetes mellitus, PON1 is dysfunctional due to glycation, reducing its ability to retard LDL and cell membrane oxidation and contributing to the inflammation typical of diabetes, leading to the excess atherosclerosis common in this disease.